Dragon watches on in shock as Helen Black transform her appearance into that of his long-missing wife, claiming to have been her all along. Jennifer explains how the only way she could regain the ability to walk was to gain new superhuman abilities. She had Gertie Funt do research on the subject but this led to numerous dead ends. Mister Glum then took over the world and Jennifer spent that entire time working on her stomach due to her paralysis. After the defeat of Glum, Jennifer learned that her daughter had been turned into a ruthless killer and had fled the planet with her partner. Dragon then replaced his daughter with his own reality’s version of Angel and moved in with Alex Wilde before then beginning his quest to find her. 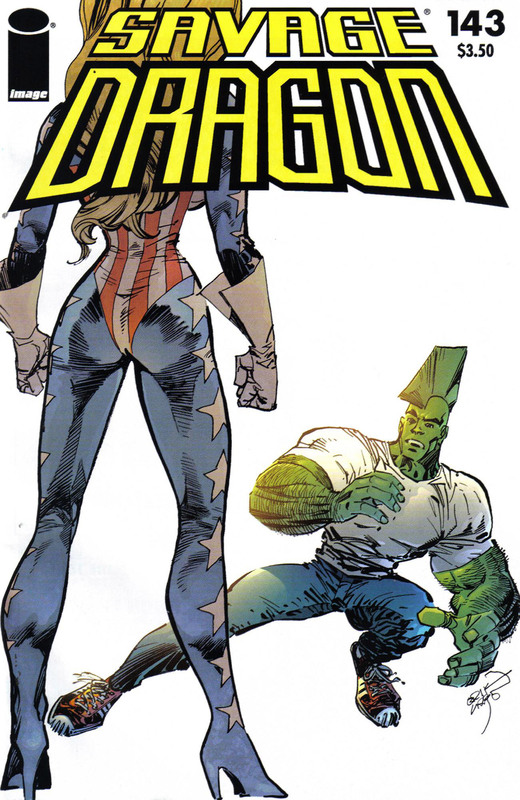 Jennifer had no intention to return to Dragon after he ruined her life but when she finally received new powers, she sought to set up a test for him. She posed as Helen Black and then tried to seduce Dragon, proving that he does not truly care for her any longer. This story is dismissed outright as Dragon can tell from the words, body language and speech patterns that this Jennifer is an imposter. This sets off the shape-shifter into a rage, taking on the appearance of a female version of Dragon. This confuses the hero somewhat but he defends himself, eventually managing to knock out his assailant. Dragon had hoped that once she became unconscious that his foe would revert back to her true form but she remains in this green-skinned, fin-headed body. Over in the Danger Zone, Fire Lord is confirmed to still be alive but it looks as though every bone in his body had been crushed by Red Giant’s blow. Alex takes Chris Robinson into another room for a private conversation. She is surprised to see him in fighting shape and back acting as a vigilante. Chris explains that his whole family died during Glum’s reign and he is now all alone. His wife had a heart condition which meant that the manual work they were performing soon caused her to die. Their children could not long keep up with the gruelling schedule and their supervisor shot them dead. Chris is now looking to help others out as he no longer feels anything for himself. Malcolm Dragon and his companions awaken in strange surroundings and when they hear robots moving towards them they fear that Glum had deposited them on another alien world. Rex Dexter emerges from the shadows with his assistants and assures them that they are back on Earth. The kids celebrate as Rex begins to contact their parents. Dragon escorts his prisoner back to the Chicago Police Department where he informs Frank Darling of his suspicion regarding her identity. He believes that Gertie Funt used the research into super-powers to gain abilities for herself and used her knowledge of him and Jennifer to create her ruse. This cannot be confirmed though as the shape-shifter seems to have become a ranting lunatic. Dragon then receives a call from Rex asking him to come to his laboratory. With Chris having returned, William Jonson offers to give him back the Star costume. Red Giant announces that she had wanted to retire from being a superhero anyway so this has come at a perfect time. Battle Girl notices that Alex is obviously still attracted to Chris but their conversation is interrupted when Rex calls. He instructs Alex to take Angel with her to his laboratory and when he learns that they are at William and Rita’s home, he asks for her to bring them along too. The heroes head down into the underground lair where they are reunited with the children after their years of exile in Dimension-X. William and Rita get to meet their twin sons for the first time in this reality. Janey is upset that there is no one there to meet her but Angel points out that there is another version of her here already but that her parents are on their way anyway. Malcolm and Angel enjoy a reunion before Rex makes an announcement. It seems that the Angel from this reality had attached a note to Malcolm’s shirt which Rex then reads out to the group. Back when she was brainwashed by Glum, Angel had forgotten all about her mother and when Jennifer came to the Creator’s hideout looking for new powers, she killed her without a second thought and buried her body. She would have confessed sooner but Glum found it amusing to watch Dragon suffer during his search. Angel will remain in Dimension-X with Glum and help him forge a new empire as returning is no longer an option after all of the horrible things she committed. She ensured that Malcolm was returned to give Dragon some measure of happiness and asks that they do not try to bring her home. Dragon is left devastated by the news whilst in Dimension-X; Angel watches her letter get read out via Glum’s looking glass and cries over the whole thing. Alex Wilde is responding to an emergency call that has already seen several of her colleagues fall at the hands of a powerful villain. She arrives in time to witness Red Giant fall unconscious, with Star having already been knocked out. Bud Ugly emerges and is revealed to be the criminal responsible for their defeat and he goes after Alex next. The sight of Bud Ugly startles the police officer and Alex instantly knows that she is out of her league against the villain. 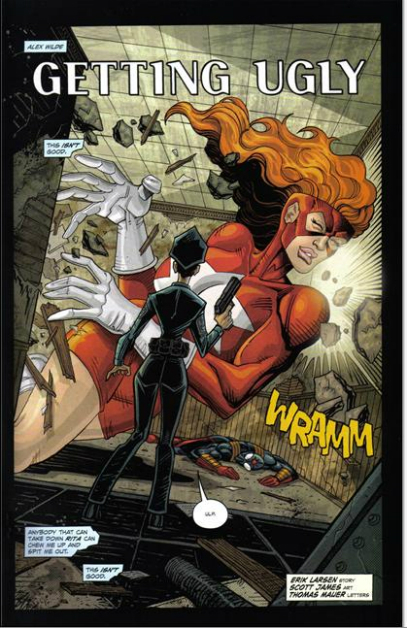 Alex desperately flees through a building to hide from her opponent but knows that it is only a matter of time before she is caught. A telephone call to Battle Girl is made but the teenager is apparently at home doing homework for once. Just as it looks like certain death for Alex, her pursuer is struck down by a single blow from Battle Girl. She had secretly followed Alex out on patrol and was forced to act before the villain could claim his next victim. With Bud Ugly apprehended, Alex admits that for once Angel not staying home and studying when she should have been has turned out for the best.